Wir haben einen frei verfügbaren Onlinekurs zum Thema Grundlagen der Dateiverschlüsselung mit CrococryptFile in Englischer Sprache ("File Encryption Basics and Practices with CrococryptFile") veröffentlicht. Sie finden diesen unter anderem bei Vimeo, EH Academy und Udemy. Auf Anfrage ist der Kurs auch im SCORM-Format für Learning Management Systeme (LMS) verfügbar. Falls Sie nur einen schnellen Eindruck von CrococryptFile in Aktion haben möchten, empfehlen wir die Video-Kurzdemo am Ende dieser Seite. Wir stellen den Trainingskurs ebenfalls als kostenlose Offline-Variante in Form einer portablen Windows-Anwendung bereit. Bitte beachten Sie, dass aufgrund des enthaltenen HD-Videomaterials der portable Entpacker ca. 125MB groß ist und die entpackte Applikation ca. 250MB Speicherplatz erfordert. 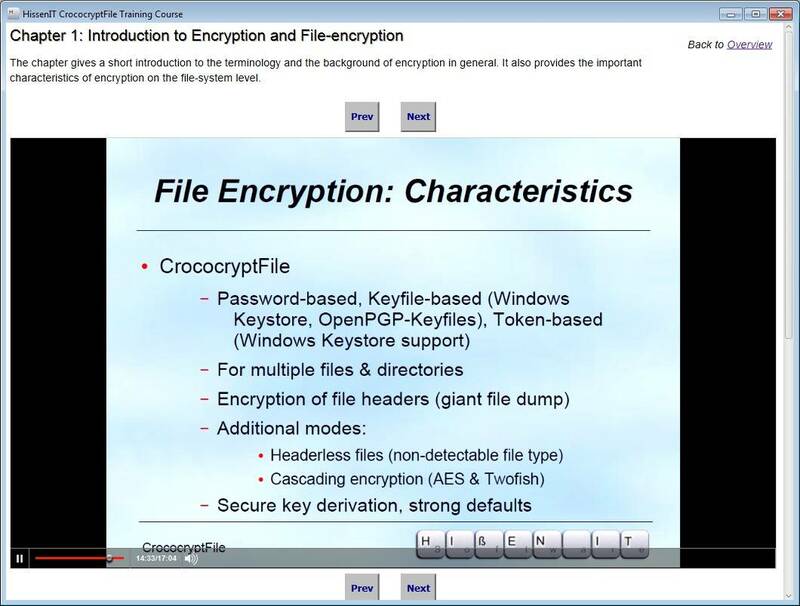 1 Introduction to Encryption and File-encryption The chapter gives a short introduction to the terminology and the background of encryption in general. It also provides the important characteristics of encryption on the file-system level. 2 CrococryptFile Windows Installation The chapter contains how to download and install CrococryptFile on Windows and provides a basic overview about the installed components. 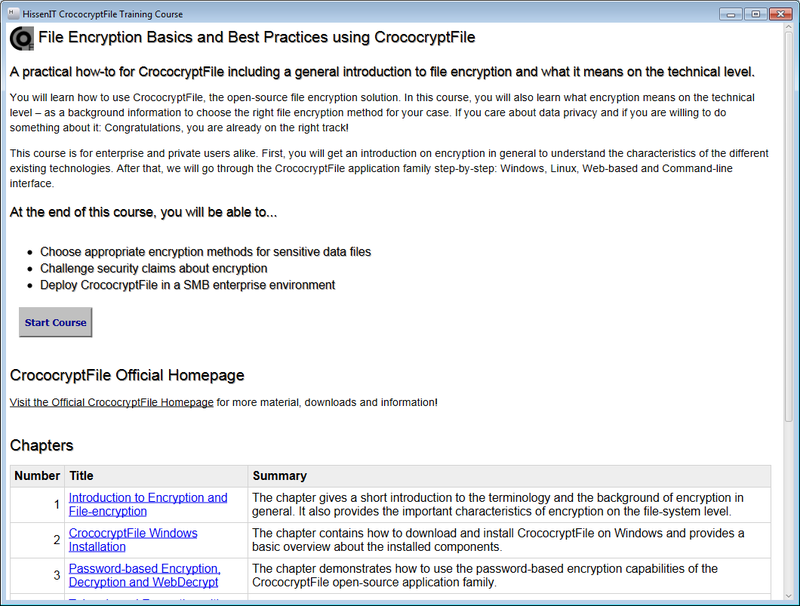 3 Password-based Encryption, Decryption and WebDecrypt The chapter demonstrates how to use the password-based encryption capabilities of the CrococryptFile open-source application family. 4 Token-based Encryption with Windows Keystore and OpenPGP The chapter demonstrates how to use tokens to encrypt file archives with CrococryptFile. 5 Forensics on Headerless encrypted Files The chapter explains the forensics regarding privacy issues of encrypted file archives and demonstrates the usage of headerless files with CrococryptFile. 6 Linux, Unix and Command-line usage The chapter demonstrates the *ix user interface (UI) of CrococryptFile and the command-line interface for server and scripting purposes. - Course Assessment Questionnaire This assessment questionnaire provides the opportunity to verifiy the learning progress.